Hero Histories: Video Fridays: THE GREEN HORNET in "Deadline for Death"
Video Fridays: THE GREEN HORNET in "Deadline for Death"
A series of robberies of wealthy homes has one thing in common...all the victims had recently been profiled by Daily Sentinel reporter Mike Axford! Has he used his interviews to case the homes? 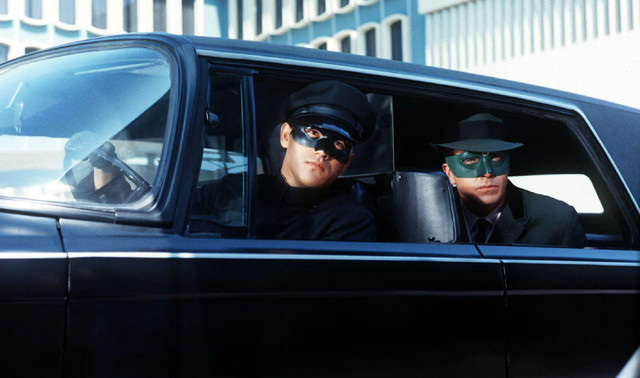 When Axford is arrested at the site of the latest break-in, The Green Hornet and Kato must uncover evidence to free the hapless newshound. The Green Hornet has his first solo fight scene...which he loses! (To be fair, it is against three guys.) When he and Kato catch up to the three crooks in the finale, guess who wins? Seeking info, The Hornet questions a stolen-goods fence named Tubbs, indicating that he's been allowing the fence to continue operating as long as he served The Hornet when needed. A nice touch, adding credibility to the crimefighter's cover as a criminal. More location shooting, this time at a small local airport and aircraft hanger also used in several Batman episodes. Here's the 12th filmed and aired episode..."Deadline for Death". "The Gifts are Afoot, Watson!" It's Crime Time at Christmas Time! "Have no fear! The Fans of Bronze are HERE!" The Doctor is IN...and he's STRANGE!